Best places to eat in Brisbane. My cousin Peggy, visiting Brisbane from Malaysia, asked me late last week if I have any good eating places to recommend. Off the top of my head, all I could think of was Thai Wi Rat in the Valley, where I used to go often for grilled cat fish (Pla Dook Yang) and while they still had it on the menu, cat fish floss salad (Pla Dook Fu). Then I remembered Pho Hoang Gia on the corner of Wickham St and Kemp Place, where I went for savoury pancakes filled with seafood and served with raw vegetables (Banh Xeo) and had some of the best beef stew (Bo Kho) and I realised that I have to, just have to, compile a list so as to do justice to all the fabulous eating places I’ve frequented. Okay, this list is going to come across as biased since most of these eating places (apart from those in the Valley) are either in the 4101 (where I lived for 3 years) or in Sunnybank (where I shopped most weekends), but I wouldn’t be true to my palate if I excluded them. A picture of me in Malaya Corner having Chicken Rice and $2 soup. A picture of me and Amanda at Riverside Malaysian restaurant in Highgate Hill. 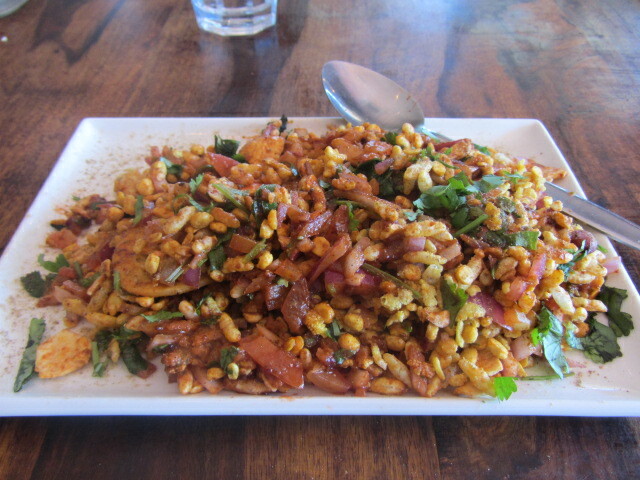 A picture of Masala Chaat at Bombay Dhaba in Brisbane. A picture of Ika Natto at Sakura Restaurant in Brisbane. Is it real or is it fake? 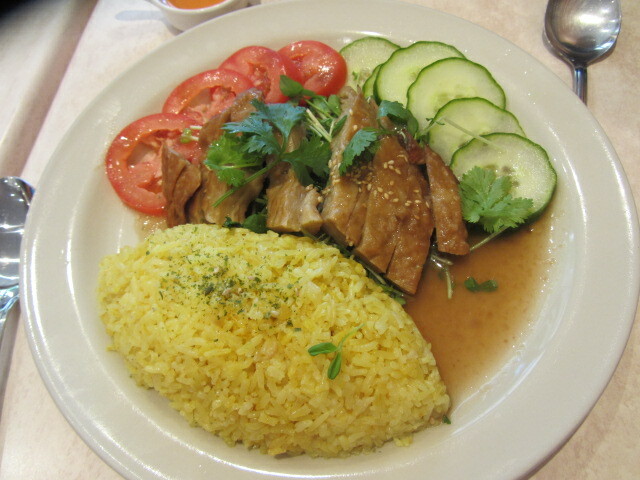 A picture of vegetarian chicken rice at Tea Master in Fortitude Valley. A picture of Banh Xeo from Pho Hoang Gia in Fortitude Valley. A picture of the vegetarian set at Makanan Indonesia in Brisbane. A picture of Meat Lasagne at Pasta Al Dente in South Brisbane. 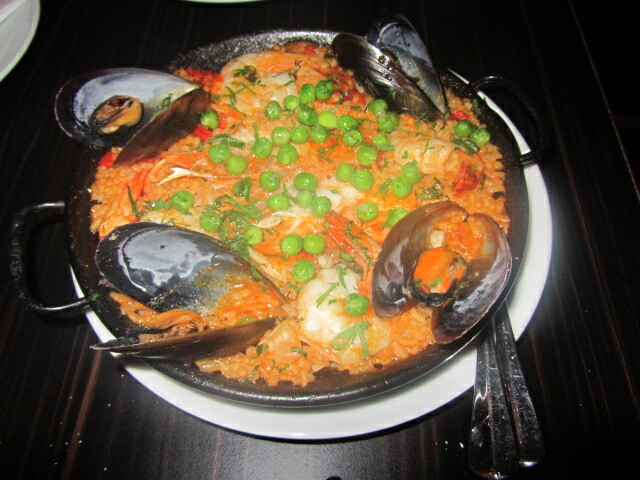 A picture of seafood paella at Granada Tapas Bar in South Brisbane. A picture of me and my fellow surgeons’ wives at Aria in Brisbane last May. Now you probably know why I have to be on a diet half the time. I’ve eaten at many, many, many more places, but these are the ones that stick out in my mind. Bon Apetit! 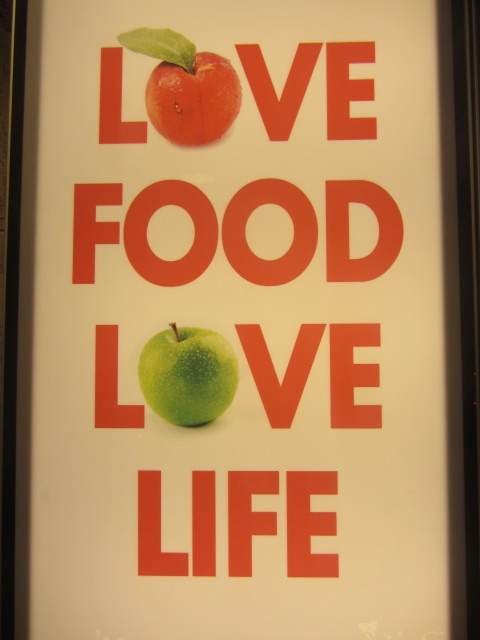 My personal philosophy: Love Food, Love Life. A picture of signboard I saw in a hawker centre in Penang, Malaysia. This entry was posted in Food, Travel and tagged Brisbane eating places, food and more food, good food in Brisbane by Estella. Bookmark the permalink.